Runabouts® reflect 49 years of G.M. 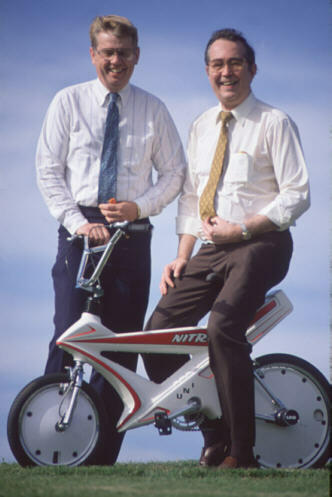 Design & Engineering activities by their creators, Roger Berg and Frank Scott. They are shown with their 'Sky Bike' which they designed & built for Disney's TV movie, 'Ask Max.' The Sky Bike was the 'star' of the show! It's built-in air cylinders propelled it over objects, like football goal posts!